We had the opportunity to attend the media preview for Stone Mountain's newest attraction, MegaBugs! Adventure Encounters, I was a tad hesitant because … well come on, megaBUGS. All kidding aside, here is our take of Stone Mountain and its Mega Bugs exhibit. 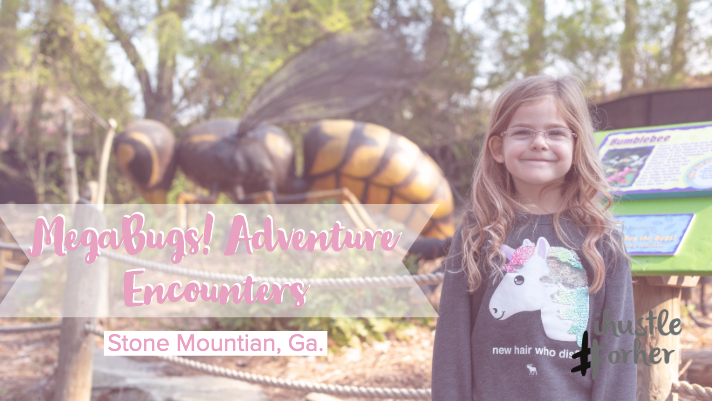 My childhood memories of visiting Stone Mountain are of a fun outdoorsy place with lots of great picnic spots and cool views, not to mention the fun ride to the mountaintop in the Skyride Gondola! These days, Stone Mountain is so much more and bills itself as a “Theme Park.” With so much new stuff to do there, you definitely need to plan on spending the entire day. The newest attraction at Stone Mountain, the MegaBugs exhibit, is not nearly as scary as I thought it would be! The exhibit consists of an outdoor walkway lined by large sculptures (some even move) of different types of bugs. There is educational information posted by each bug display, making it a fun learning experience. This is not a hands-on type of experience though, so be prepared to walk and observe. I was thankful for this, but some families may expect to see actual bugs here, which is not the case. I was able to bring my four-year-old daughter and her three-year-old cousin along for the visit, and both enjoyed the larger-than-life bugs. Parking is expensive: It is $20 to park! On top of that, all the attractions cost money, so you are looking at a pricey day. It is huge: Make sure to plan; the park is large with all kinds of activities. Decide what you want to do before arriving so you can make sure to pack in as much fun as possible. Bring lunch and snacks: They have lots of food options but on top of parking and tickets it gets pricey. This fall, I spent over $150 on parking tickets and food for the evening, and that was just for my daughter and me. Wear closed-toe shoes: There are plenty of non-outdoorsy things to do, but what fun is that? Make sure you and your kiddos are dressed appropriately for lots of walking and outdoor fun. Overall we recommend spending the day here. It is a beautiful historic spot in Georgia and there are tons of fun activities for all ages! Stone Mountain Park is just 15 miles east of Atlanta on 3,200 acres of natural beauty. Adventure awaits as you discover a wide variety of family-friendly activities and recreational options, plus many natural and historic sights. You also won’t want to miss the dozens of exciting annual events. The Park is open year-round, but attractions, events, and Laser show hours vary by season. Be sure to check dates and hours prior to your visit. MEGABUGS! Adventure Encounters opens March 30, 2019, for the start of Spring MEGA FUN Break, and runs for select dates through November. It is included with All-Attraction Passes and Mountain Memberships.